We’ve had a fine time on the calm(ish) waters of Lake Phalen so far. It’s hard to believe there is only one weekend left* of this season’s on-water reading. We’ve been joined by hundreds of patrons and dozens of floating volunteers, we’ve paddled against some mighty winds, and luckily had only one day of epic rain during which we were smart enough to stay home. Jessica David’s felted The Deep Murky Green-Brown Lake has delighted nearly every patron. Ditto with our trio of Prince-related books, two of which were commissioned this year. Utopias of Southern California sought to relieve its drought by going for a swim. We had our first ever sailboat patron. A sailboat race took place on the lake as we set up shop on the 3rd weekend, dotting our view with lovely striped sails. We made friends with Jim, the motor boat driver assisting the sailors. He was impressed that one of the librarians was also a pirate, and he pulled a still-in-the-package pirate eyepatch out of his bag for Elle to wear. He also towed the Floating Library with his boat, and dropped us near a buoy. Floating Librarian Elle dressed up as a pirate. Nuf said. People returned their library books! Many families arrived by paddle wheeler, perhaps the best watercraft for reading and the worst for steering and speed. Sarah Stengle kayaked out with a handmade, waterproof Finnish harp and played “Happy Birthday” for a library patron during two afternoons of serenade. A sailboat collided with the Library during the sailboat race, but the collection and the raft held fast. Another patron impressed us all by flipping his kayak not once but twice. The clouds in the sky have been astounding. Our canoe escaped and it was heroically saved by our guardian poet angel, Molly Van Avery. And the next day, when this happened again, it was saved by another pair of heroic paddlers in a canoe. We welcomed a kid sitting in a canoe inside a strawberry-sprinkle donut-with-a-bite-taken-out-of-it pool floaty. Overall, Floating Library patrons never cease to amaze, impress, and make great conversation on the water. Visit the 2016 photo album to witness some but not all of these incidents. Of course, the only way to really experience it is to paddle out yourself! 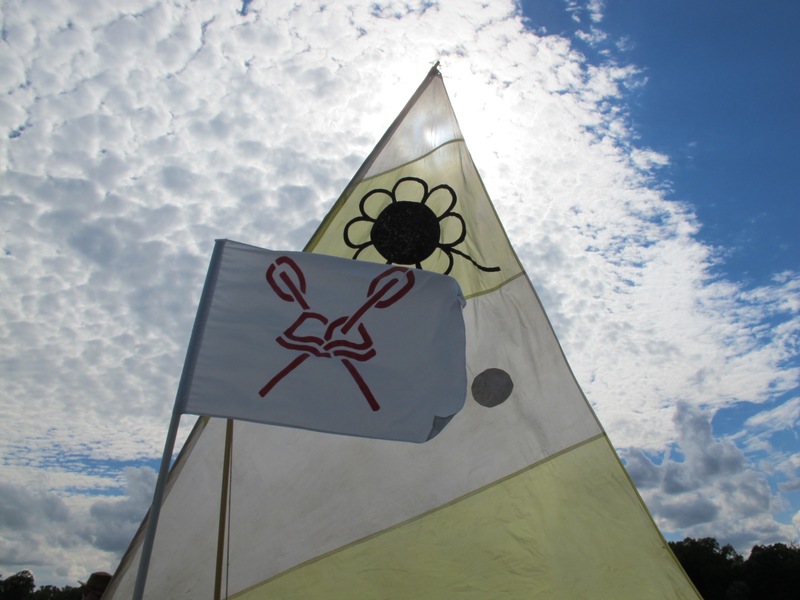 There’s only one more weekend of boating around a lovely lake and reading artists’ books. *Make a plan now to visit during our final open hours, 1-7 pm, Saturday, August 6 and Sunday, August 7. 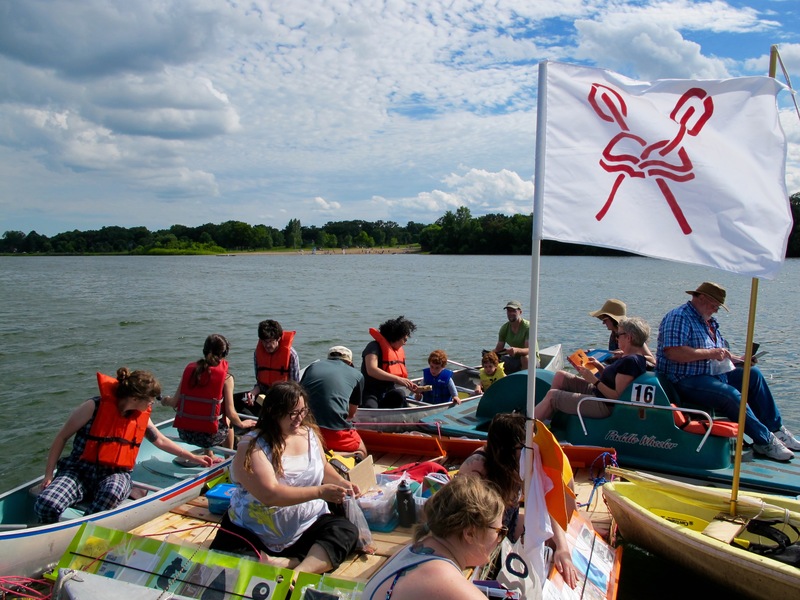 Boat rentals are 50% off thanks to support from the Metropolitan Regional Arts Council. Come see the dissolvable book disappear before your eyes! Learn animal words in Hmong! Practice tying knots with our waterproof instructional manual! Discover the mathematical mysteries of a hexaflexagon!